As the Olympic swimming events came to an end, four U.S. swimmers alleged they were robbed at gunpoint early Sunday, Aug. 14 after leaving a party. Their initial report claimed that they were attacked by robbers posing as police officers. However, Brazilian authorities have found some holes in the swimmers' claims and are suggesting the story was fabricated. As the investigation continues and the U.S. swimmers are expected to provide further statements, you might be wondering: Who is James Feigen? Rio is detaining this Olympic swimmer after allegedly false robbery claims. Update: Brazilian police officially declared that the four U.S. swimmers were not victims of robbery, BuzzFeed News reported. Instead, the Brazilian officials said that the swimmers "vandalized the restroom" of a gas station and they tried to leave the scene before police officers could arrive to help. Earlier: Feigen is a U.S. Olympic swimmer, who made his debut at London's 2012 Summer Games. He earned a silver in the 4x100-meter men's freestyle relay in London and four years later, won gold in the event in Rio after swimming in the preliminary heats. 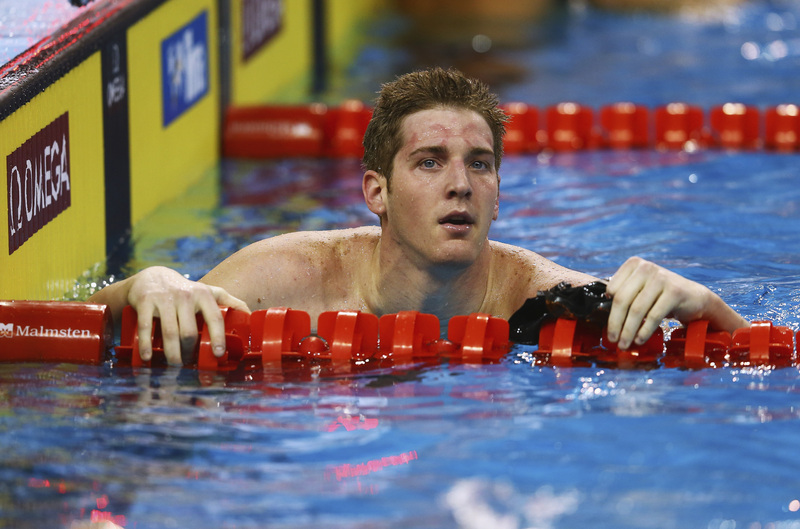 The 26-year-old is currently being held in Rio by Brazilian authorities who are investigating the robbery claims made by Feigen, Ryan Lochte, Jack Conger, and Gunnar Bentz on Sunday. Since their allegations, video footage and witness testimonies have surfaced and suggested that all is not as it seems with the U.S. swimmers' story. The athletes' original accounts noted that their wallets and money had been stolen by a gunman. However, in footage of the swimmers returning to the Olympic Village on Sunday morning, they appear to have their wallets, thus poking holes in their allegations. During a phone interview, Feigen told USA Today, "I'm just trying to give Brazil what they need or what they want and get out of here. It's a hassle. But I'm safe, everything's fine." Feigen was expected to meet with investigators on Thursday to make further statements on the alleged incident, however, his location cannot be disclosed by the United States Olympic Committee due to security protocols, according to USA Today. Feigen also told USA Today, "Until this goes in a direction where I can see it, I can't comment." Feigen and Lochte were the only two members of the group who gave an account of the incident to police, the New York Times reported. However, the publication noted there were "points of confusion" in their testimonies. According to prosecutor André Buonora, if they provided false testimonies to police, Lochte and Feigen could face charges, the New York Times reported. The Rio 2016 spokesman Mario Andrada, issued a statement on the events on Wednesday, noting, "Let's give these kids a break. Sometimes you take actions you later regret. They are magnificent athletes. Lochte of one of the best swimmers of all time. They had fun. They made a mistake. It's part of life. Life goes on." The issue is not whether these four swimmers are "magnificent athletes," as Andrada suggests, but rather how their irresponsible allegations create a negative portrayal of both Rio and its residents.